Description: DVD Movie Playback Kit required for playing on the Xbox. Use your remote control to play this fully interactive game on your DVD player! Dirk the Daring, the brave yet bumbling knight, is ready to venture back into the lair in this all-new adventure! The evil wizard Mordroc has again kidnapped the fair Princess Daphne and you are her only hope. Save the Princess, defeat Mordroc, and watch out for the treachery that lies at every step! You will need razor sharp reflexes to triumph in the Dragon’s lair. Within the deceiving hallways of an enchanted castle, Princess Daphne calls out for your help. Lead on brave adventurer… your quest awaits. • Relive the arcade experience with this all-new adventure. • New, state-of-the-art graphics with toon shading technology. • All the excitement of the original, with new levels, and characters. • 5 new bonus scenes, playable after defeating the evil wizard. • 43 levels and 9 exciting boss battles await you! • Art gallery with never before seen images from Don Bluth Studio. 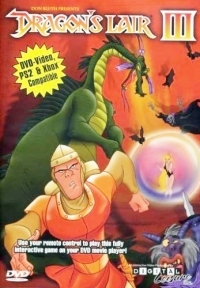 • Includes the complete Christopher Stone Dragon’s Lair soundtrack. 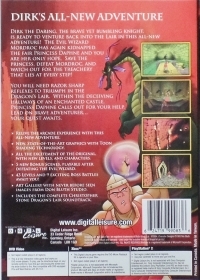 This is a list of VGCollect users who have Dragon's Lair III (DVD) [NA] in their Collection. This is a list of VGCollect users who have Dragon's Lair III (DVD) [NA] in their Sell List. 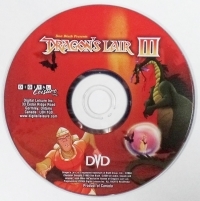 This is a list of VGCollect users who have Dragon's Lair III (DVD) [NA] in their Wish List.